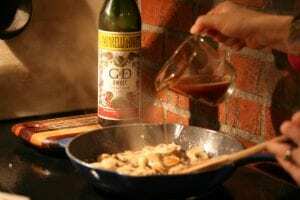 This recipe is a twist on Veal or Chicken Marsala often served at upscale Italian restaurants. 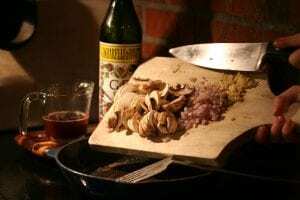 I did not have any Marsala wine on hand when I made it and found that a dash of sweet vermouth works just fine (as would apple cider or grape juice)! Pound and soak venison in brine as described in steps 1 and 2 here for a few hours. Can be shortened to just an hour if you are pressed on time. Heat 1 Tbsp. olive oil in a large skillet over medium high heat. 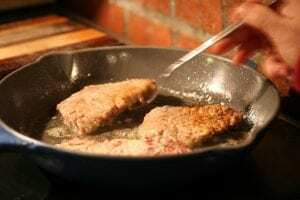 Dredge venison cutlets in seasoned flour and place in hot oil. Sear the meat until golden brown, a few minutes on each side. 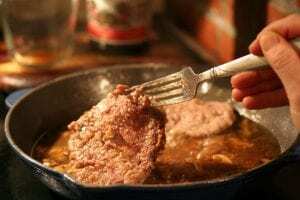 Remove the venison from the pan and place on a plate. 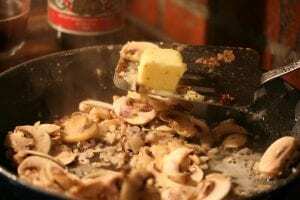 Add the mushrooms, shallot, garlic, parsley, and 2 Tbsp butter to the skillet and sauté until the vegetables are soft, about 5 minutes. Add the beef or veal stock and the vermouth to the pan. 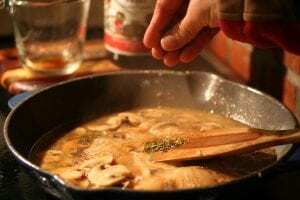 Let mixture simmer, almost boil, for a few minutes to thicken the sauce and stir to make sure it doesn’t burn or stick to the pan. Add the venison back to the pan to heat through and get mixed with the sauce flavors. Add the thyme. Plate the venison and spoon mushrooms and sauce on top of the meat. 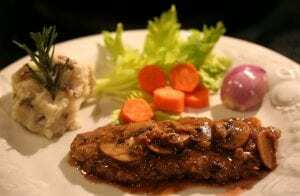 Tastes great with mashed potatoes! Serves 4.